We are proud to announce that the Laurel Pointe Community Association has selected Tinnelly Law Group as their association’s legal counsel. 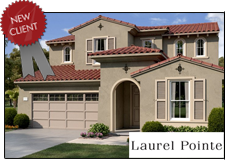 Laurel Pointe is a brand new gated community in the city of Vista being developed by Pulte Homes. Laurel Pointe is located just seven miles from the Pacific Ocean and sits above the incredible 16 acre Vista Sports Park. Laurel Pointe’s spacious homes will feature distinctive architectural styles including Spanish Colonial, Early California and Monterey. Its residents will enjoy dedicated walking paths to the Vista Sports Park, as well as short walks to the Melrose Sprinter Station and the Guajome Regional Park. Our HOA attorneys and staff look forward to working with Laurel Pointe’s Board and management.